Jagor’s water snake (Enhydris jagorii) is a freshwater snake that is endemic to the Chao Phraya-Ta Chin basin, Thailand. However, habitat change and destruction are the main threats to this snake, where a large area of the wetland has been rapidly transformed into urban and agricultural areas. Moreover, uncontrolled fishing seriously threatens the remaining population of this snake. In order to protect this species, information on its natural history is required. This study was conducted in the Bung Ka Loh wetland during October, 2010 to August, 2014 when 108 specimens of this species were collected. Analysis of the stomach contents revealed that it is piscivorous, with cyprinids being the dominant prey. Prey items were usually less than 10% of the snake body mass and multiple prey items were occasionally found. No significant difference in diet was noted between the sexes. 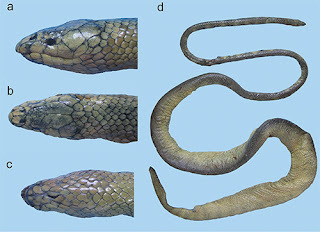 In addition, predation on this snake by Cylindrophis ruffus was first recorded in this study. The smallest gravid female collected had a snout-vent length of 34.0 cm. The clutch size and mass ranged from 1 to 28 embryos and 3.1 to 123.0 g, respectively, and both of these quantities increased significantly with increased female size. Reproduction was possibly seasonal and occurred in the rainy season. A preliminary study of other wetlands in the central plain of Thailand failed to detect the existence of this species. Accordingly, the conservation status of this species should be changed from Data Deficient to Critically Endangered.